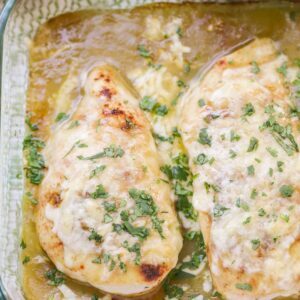 Green chili chicken is an easy and delicious recipe filled with spices, cheese and green chili sauce guaranteeing it will become a new favorite in no time. Place chicken on the bottom of a sprayed 9x13 dish. Season with garlic salt and chili powder. Pour green chili enchilada sauce over the chicken. Bake at 375 for 25-30 minutes until chicken is cooked through. Top with shredded cheese and broil for a minute until cheese is melted.